40 0801-0224 - 8 X 1inch Screw. 55 0801-0221 - No. 6 X 1-1/2 In. Screw. 36 H4433-9569 - Hoodlatch. Bbb - White. 54 74550-2719 - Dash Knob. 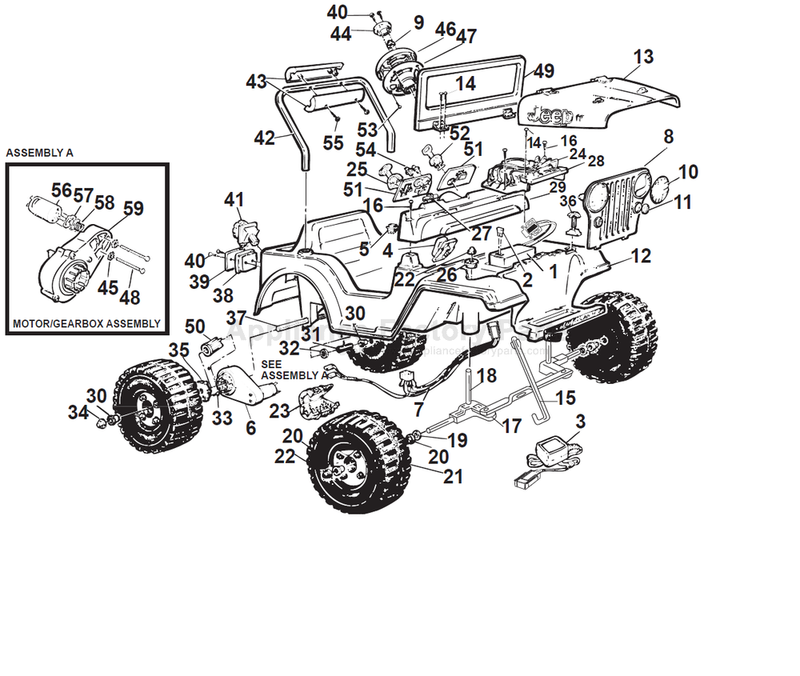 17 76181-4229 - Steering Linkage . 18 73241-4509 - Front Axle . 26 74770-2669 - Post Bushing. 11 74770-2349 - Turn Signal Lens. 27 74771-2719 - Radio Dial. 37 76135-4509 - Rear Axle. 42 74760-4219 - Sports Bar. 74770-2369 - Axle Post Support. 8 74780-2149 - Grill Assy. Camp Barbie Jeep. 74780-2699 - Dash Panel Set (incl Both Sides).